I have always wanted to make a bell rope, but in my mind the biggest setback was not having a bell to hang the rope from. 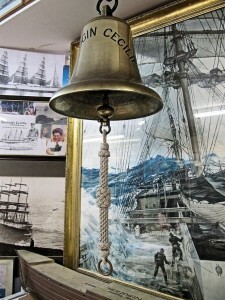 For many months, leading to years, I had been searching for the ideal ships bell. 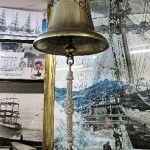 The trouble was that the bigger the bell the greater the cost. Then if the bell had a name on it, it would be well out of my budget. However every so often I would check eBay to see what was on offer. Then one-day I got lucky! 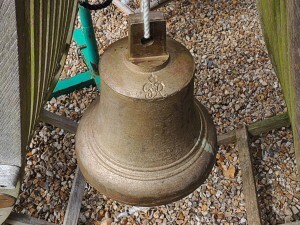 Somebody had posted an very sad looking old bell on-line, with a buy it now price. 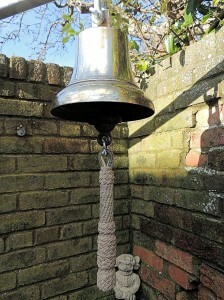 So I leapt at the chance and purchased the bell. It had a rather rough exterior with a George V marking, it also still had the original clacker. 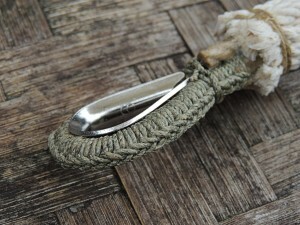 Even though I had the bell, I still could not make a rope for it till I had cleaned it up! So two good weekends were spent getting it polished to a high shine. 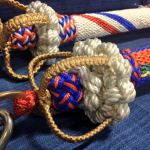 My first issue was which rope to use when making the bell rope? I decided that I would use polished hemp that I had previously bought from Des Pawson. The first thing I did was to find a piece of rope that would fit snugly around a stainless steel rope thimble that I already had. I then began to cover it with a very fine polished hemp that I had. This particular section was covered with Cockscombing. 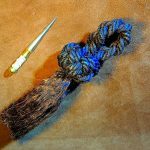 After I had covered the rope I then let the two ends of the rope hang down and tied them off at the base of the thimble with a constrictor knot. 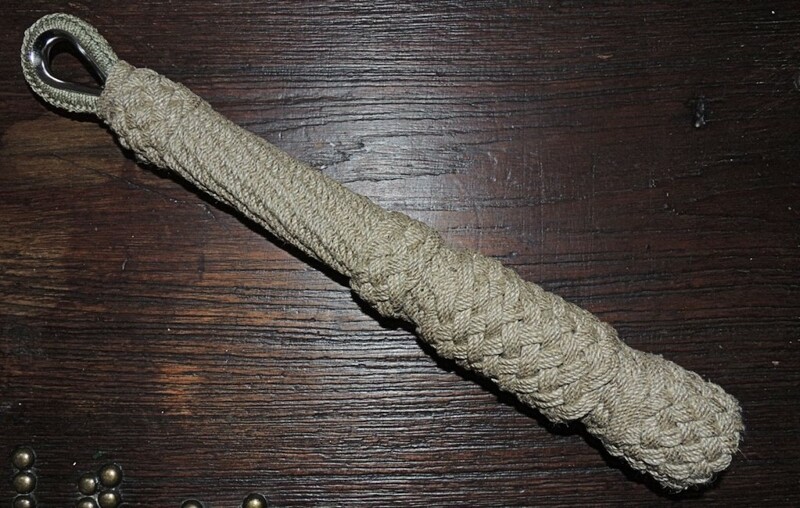 I then got a thin wooden dowel and ran it between the two lengths of rope, so as to ensure that the finished bell rope would be true and stiff. I understand that when one uses strands of rope to make the core of the bell rope thicker this is sometimes called Puddening? However I see very few references of this on-line. Anyway what I did was lay multiple strand of cord along the length of my bell rope till I had achieved the overall desired thickness. I then added an additional layer at the end where the bell rope would be most handled. The picture here does not show the additional layer. Now that I had the guts of my bell rope in place, it was time to make it look pretty. This is where my polished hemp came into play. I evenly placed 12 strands around the bell rope, I then began to Crown Sennit along the length of the core. Now that I had the basic bell rope made, I just needed to make it look nautical and something that also looked good enough from my bell. I then decorated the bell rope with some Turks Head Knots and Globe Knots, but also left a clear area so that the Crown Sennit would show. 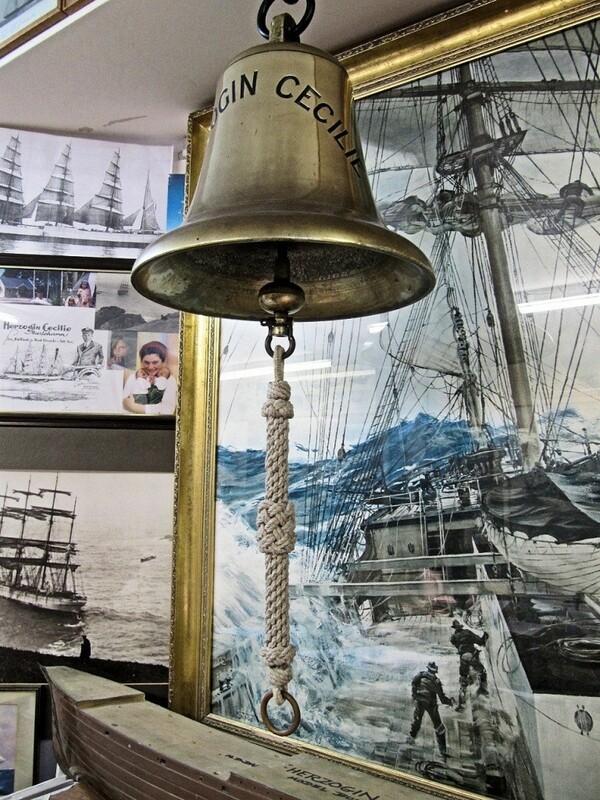 OK so now that I have a polished ships bell and a bell rope, why are they not married? Well, I have now created another problem, due to the size and weight of the bell, I am still searching for a good place to hang it. Not only that I think the bell needs a summer and winter HQ. So I am now thinking about where to hang it outside for the summer and then where indoors for the winter. The trouble is that I also have to deal with C-in-C NagHome (wife). Once I have done this I will post more photos here. To view the pictures in full size, click on them. 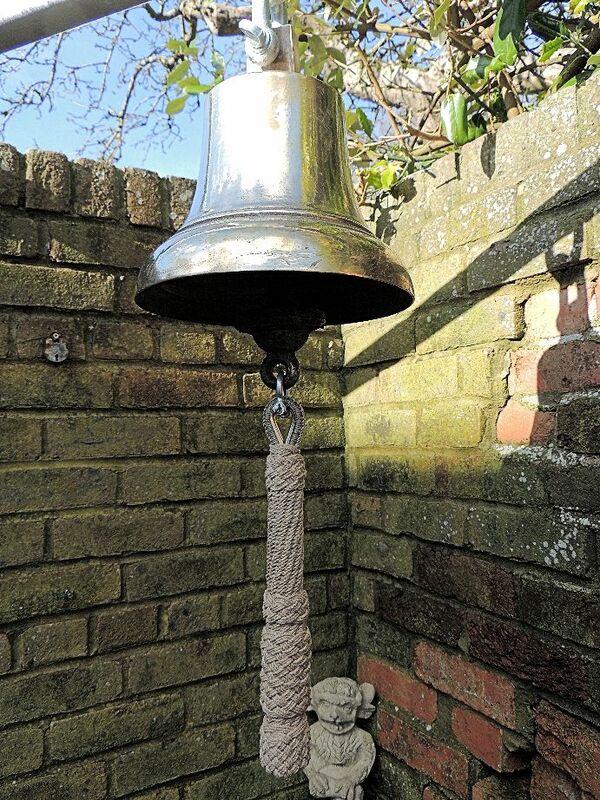 At long last I have had my beam made up and also now with a bit of sunshine, I have now managed to hang the bell outside with the bell rope. 1. 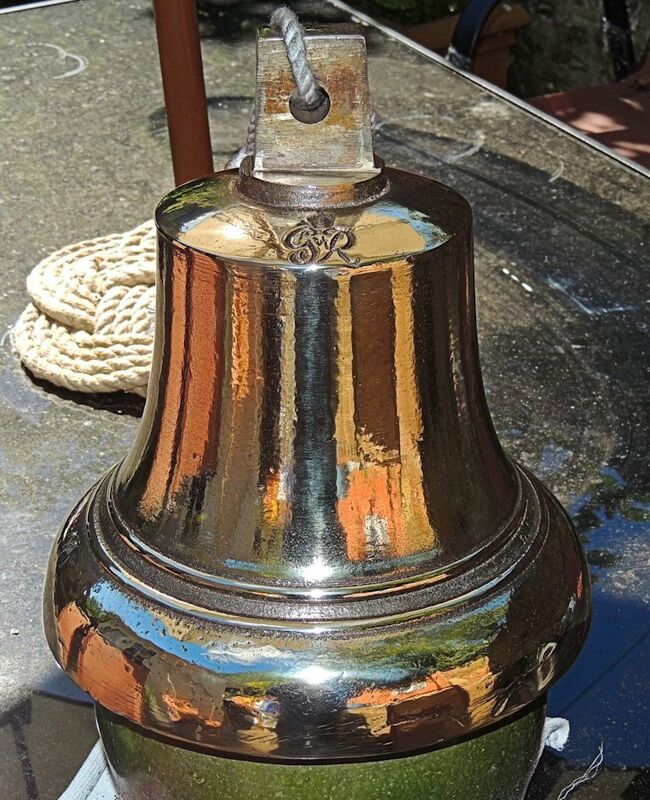 What did you use to achieve such a great shine on your bell? 2. How long were the strands used on the crown sennit? 3. Does the globe knot cover the bottom? Many thanks for leaving a comment on our site. 1. In order to create the shine on my bell, I contacted a small engineering company that sold polishing mops and various abrasives. I explained to the owner what I wanted to do and from our conversation they sent me the relevant mops and abrasive that I would need. I then used the mops, abrasive and my electric drill as instructed by the information sheet that they sent me. It took nearly a day to polish, even though I did it outside, I was filthy dirty by the end of it!! 3. If I recall correctly for the crown sennit, I made each strand about three times as long as the actual bell rope. I do recall that when I first started, it was a bit of a nightmare trying to weave with all the excess rope hanging down. By using this amount I did not end up with too much waste. I do realise that sometimes the rope you are using is precious and costly, but it is better to have too much left over than not to be able to complete the job. 3. Yes the globe know is used to cover all the loose strands that were left from crowning. I think if I did it again I would tie a small star knot and lock it in place with the globe knot, just to add to the decoration. 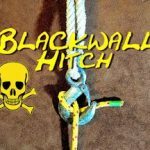 Should you create another bell rope, in fact anything of interest, please do send us a picture to add to this site. 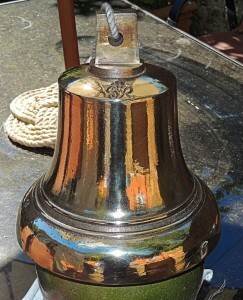 Have you used a glossy sealant so that the bell won’t tarnish again and if so, what was it. Mmmm, I am rather old school and I personally believe that a bell should be polished every morning watch!! To be honest, I polish mine once a week. 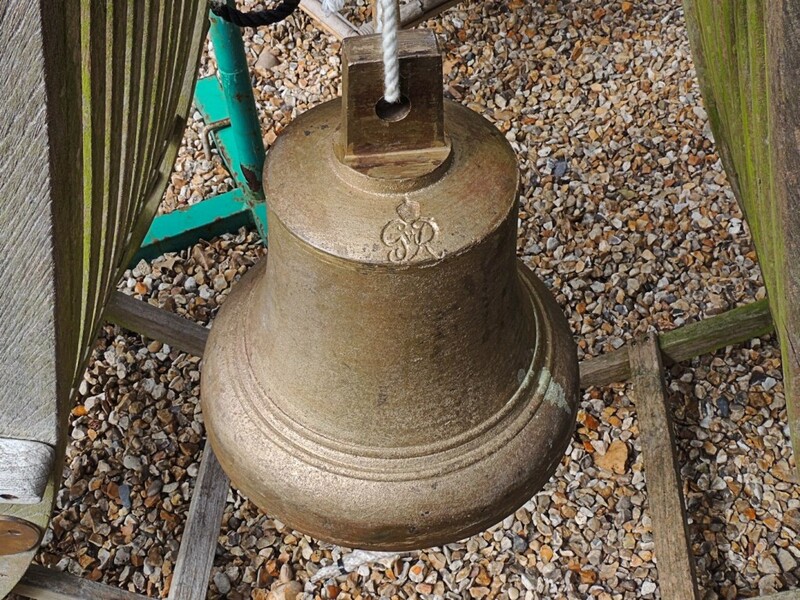 You should really add your name because your bell and bellrope will be much admired. I could use your name here but I don,t wish to embarrass you. Many thanks for your kind comment. When you have completed yours, please send a picture so that we can show it off on this site. Many thanks for your comment, I have now passed on your request to members of the Solent branch. Regards, John. What country are you in Phil? I will then see if I can get someone near you to make your bell look smart! 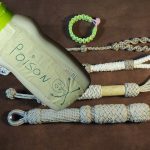 Thanks, I am based in South London and would really like a bell rope made in the UK if possible – most of the ones I have seen for sale are from the US!